Strange figures have appeared in Switzerland this summer. 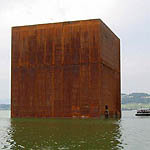 A rusty cube rises over 100 feet (30 meters) out of Lake Murten. 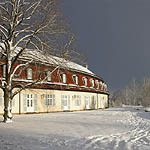 Three giant saucers hover over the shoreline of Lake Neuch�tel, and another blurry shape is at lake's end. 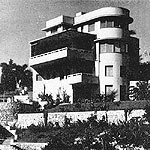 Book Review: The Havana Guide: Modern Architecture 1925-65, by Eduardo Luis Rodriguez. 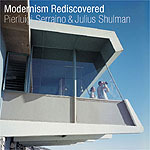 Princeton Architectural Press, 2000, ISBN 1-56898-210-0.